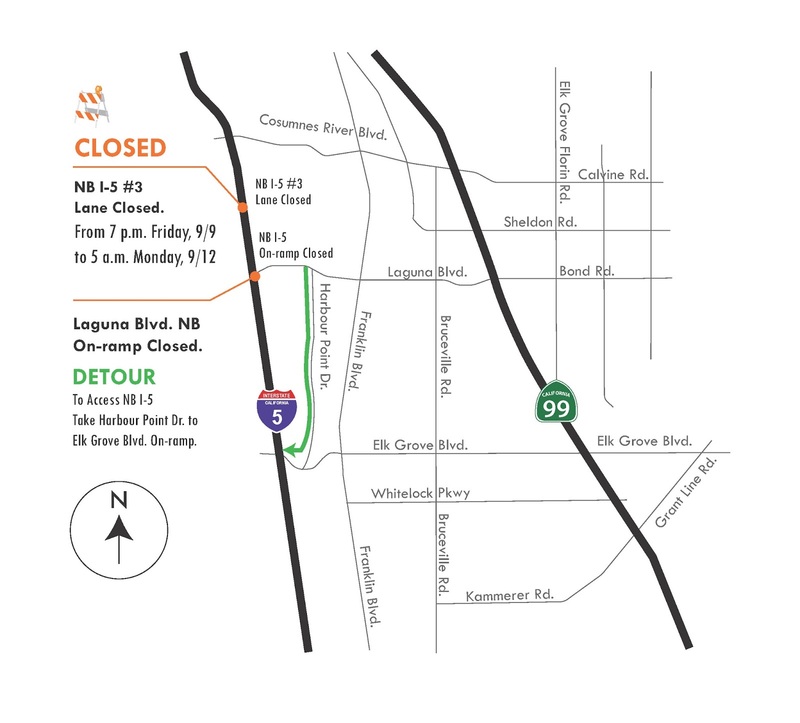 The California Department of Transportation (Caltrans) announced today emergency repairs that will significantly affect traffic will happen next weekend on northbound I-5 in Elk Grove. Weekend demolition and pavement repair work is scheduled to begin Friday, September 9 and will require a closure of the number 3 northbound lane, about one mile north of Laguna Boulevard. WB Laguna Boulevard on-ramp to Northbound I-5 closure. Traffic will be detoured to southbound Harbor Point Drive then onto westbound Elk Grove Boulevard to access Northbound I-5. Crews are scheduled for demolition, slab replacement, and striping work. Motorists are urged to use northbound State Highway 99 as an alternate route to avoid these delays, or plan for additional travel time.